I stumbled about an old thread yesterday. Definitely Temperance, Fortitude (holds a mace like Giotto's figure and a lion head), Justice and Prudence. The 'tool' is a compass - as in Prudence is all-encompassing of our inhabited sfera (hence the circular world as an occasional attribute). mikeh wrote: The only reason that these virtues don't make sense at the top, it seems to me, is that at the Last Judgment it is the virtue of Justice in particular that comes to the fore. What am I missing? Its position makes it not just the cardinal virtue Justice, but possibly identifies it with Astrea, returning to earth at the return of the Golden Age. “Now is the Virgin returning also, and the realms of Saturn come again." 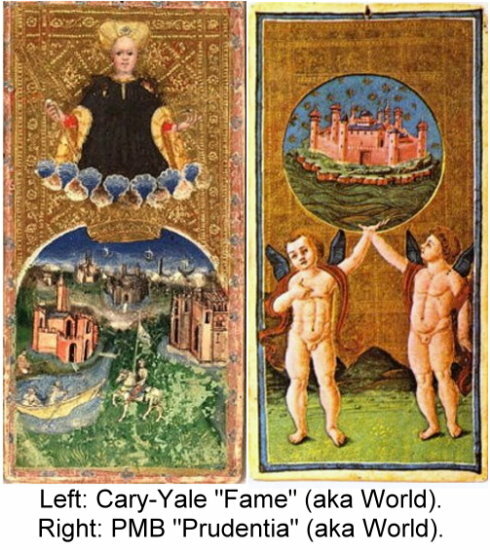 The world card and the earthy kingdom it represents, is the long-standing ideation of Ferrara with the world to come as the vision of Peace. 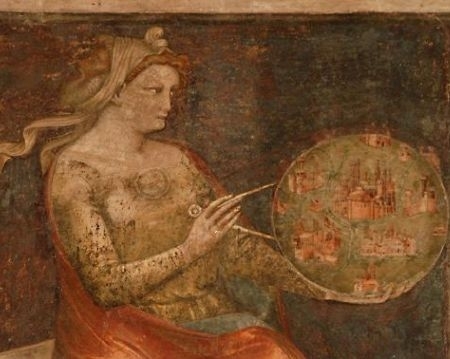 The ideation of Ferrara as the City of Peace was one propagated by Niccolo d'Este, and followed also, together with Guarina influenced 'Justice-Peace' trope by Leonello, Borso and Ercole d'Este. It is also reflected in the medal of Isabelle d'Este of Nemesis returning as Astrea in the Golden age of Peace. 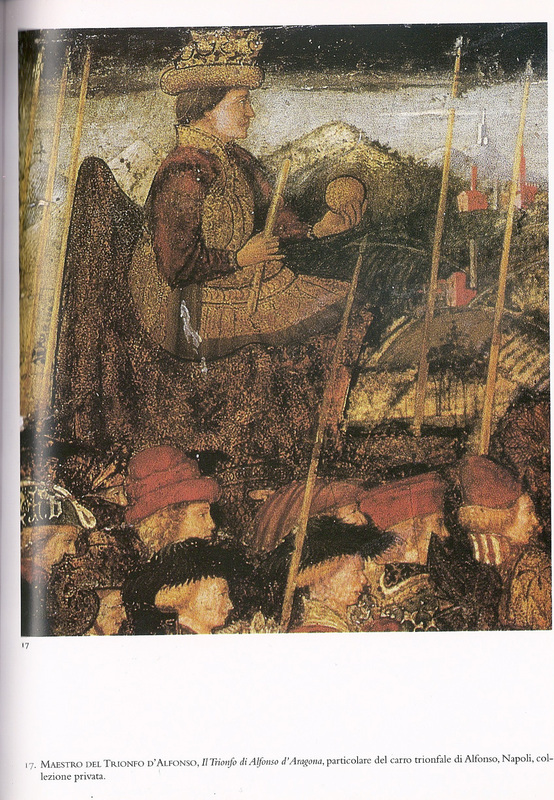 Another d'Este of the 16th century (can't find the reference at the moment) also took the motto 'Justice kisses Peace' (from psalms), so a long standing trope over time and generations among the d'Estes. Nice, I guess, as long as Justice high still is the cardinal virtue, whatever else it might be. If the world card is the "ideation" of the world to come, then how can it represent an earthly kingdom? Is it of the "new earth"? mikeh wrote: Nice, I guess, as long as Justice high still is the cardinal virtue, whatever else it might be. Loaded, secondary or conflated meaning is not, IMHO, a sufficient bases to declare that such is a departure, as some claim, from the original meaning, which must mean it is a later variation. Looking at similar triumphal type themes (as explored for example in 'Enter the King' and the advent based triumphal processions it describes), such loaded symbolism was common, a norm rather than the exception - and details of which I think would be indecipherable were it not for the records of the planning and descriptions of such. In relation to advent based themes, there are some parallels between the Justice-Peace trope and the fourth advent based processions as described in 'Enter the King'. Loaded, secondary or conflated meaning is not, IMHO, a sufficient bases to declare that such is a departure, as some claim, from the original meaning, which must mean it is a later variation. I do not understand you. If what you describe is not a departure from the original meaning of the card (i.e., the cardinal virtue), how is it a later variation? Justice as the cardinal virtue is one of four or one of seven, often part of such a group. In the tarot, it is one of 22, 14, or in any case more than 7. So it acquires secondary meaning from its placement in the series, i.e. the surrounding cards and its place in the whole, no matter where it is put, even if all four, or seven, appeared together, one after the other. I meant that we cannot deduce that a secondary meaning, as implied by its position, makes a pattern a later variation, or at least is a sufficient basis of itself to make it such (as argued by for example by Ross (and yourself? or at least, as seemingly accepted by yourself). In other words, the secondary meanings acquired by Justice when it is between Angel and World do not in themsleves imply that its being there is a later variation. If that's what you mean, I agree, and it's what I've been arguing recently; but it seems the opposite of what Ross was saying. That's awful about your computer. Well, when you can access the Internet, your contributions are really helpful. Yes, we agree. I had the opposite position a year or two ago, but when you questioned it, and Ross defended it, I thought about it for a while, at least a week, before saying anything, and then meant to be coming down on your side, changing my position from what I had said before.